FILE - Egyptian military helicopters fly overhead as army soldiers stand guard at an entrance to Tahrir Square, in Cairo, Egypt, Oct. 6, 2013. The United States on July 26, 2018, released $195 million in military aid to Egypt that had been withheld because of concerns about the country's human rights record. The Trump administration has released $195 million in military aid to Egypt that had been withheld because of concerns about the country's human rights record. A State Department spokesman said Wednesday that the move recognized steps Egypt had taken over the last year in response to U.S. concerns and sought to further strengthen the countries' partnership. He did not specify what steps Egypt took. One day before the release of the suspended aid, members of the House Foreign Affairs Committee's subcommittee on the Middle East and North Africa voiced concern about the ability of Egypt to stabilize its economy, secure its borders and improve its human rights record. Some speakers said Egypt had slipped into despotic rule under Abdel-Fattah el-Sissi, a general-turned-president, with the arrest of journalists and a crackdown on dissent. "Arrests of journalists and increasing efforts to control the media and Egyptians' access to social media are an affront to democracy and stand in stark contrast to the democratic change that the Tahrir Square revolution called for," said Representative Ted Deutch, a Florida Democrat. "Many of Sissi's actions appear as steps toward authoritative, strongman government. Egyptians have fought for democracy, not a return to totalitarianism," he said. Jared Genser, a law professor at Georgetown University in Washington, recommended that the U.S. use its leverage to secure reforms in Egypt. President Donald Trump "has no choice but to make serious cuts in Egypt's aid. It is particularly worrying that the administration may waive the human rights conditions and release the $195 million fund that was held back, which will undoubtedly be taken by Sissi as a clean bill of health on human rights," Genser said. FILE - A defendant is seen caged in a courtroom in Torah prison, southern Cairo, Egypt, Aug. 22, 2015. 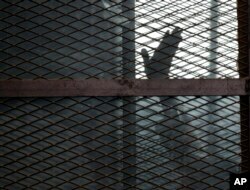 Michele Dunne, director of the Middle East Program at the Carnegie Endowment for International Peace, said, "What really concerns me is what is going on inside of Egyptian prisons, where we see tens of thousands of people. Almost all of them are young people, and we hear about the torture, brutality, and that they are often exposed in prison to militants from ISIS [Islamic State] and other extremist groups. This is a radicalization factory that would produce militants for many years to come." On the other hand, Representative Dana Rohrabacher of California, a Republican member of the subcommittee, defended Sissi's policy of detaining or killing suspected terrorists in Egypt. Rohrabacher and other supporters of the Egyptian government say the Middle East could become destabilized if Islamic State and other Islamist militant groups gain the upper hand. All the experts who testified before the panel agreed that while the U.S. cannot and should not micromanage Egypt's politics, Washington should try to persuade Egypt's leaders to allow different political opinions, free media and civil society so that Egyptians can find their way forward without destabilization or violence. Andrew Miller, deputy director of policy at the Project on Middle East Democracy, said the Trump administration has become bolder in making respect for human rights a condition for U.S. aid to Egypt. "Congress should continue such conditionality and seek an end to Sissi's crackdown on civil society, the release of political prisoners and access for U.S. military officials to Sinai for end-use monitoring. These steps would both open up the political space, which is so important to Egypt's long-term stability, and show that Sissi is willing to address U.S. legitimate concerns," Miller said.